This is common and varies in appearance, being often a coarse-looking weed, but sometimes the flowers are pretty. The rough, hairy stem is about a foot tall, the wrinkled leaves are soft and more or less hairy, and the flowers are about half an inch long, usually pale purplish-pink or purple, streaked and specked with deeper color, but are sometimes bright pink and then the long clusters are quite effective, growing in the road-side hedges. The plant is aromatic when crushed. 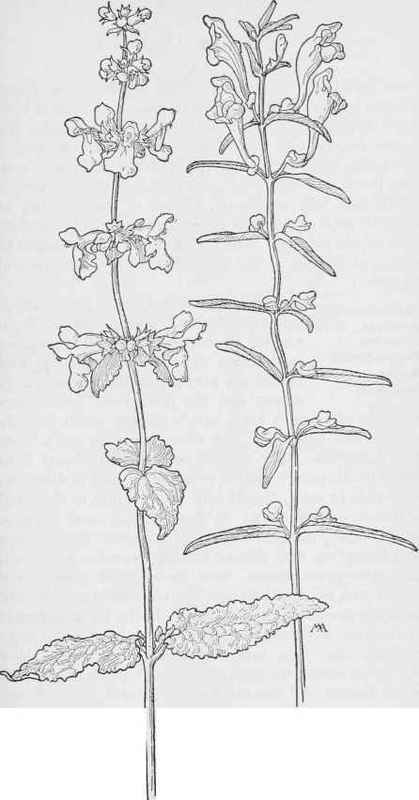 There are many kinds of Scutellaria, widely distributed; bitter herbs, some shrubby, with blue or lilac flowers; the calyx with two lips, the upper one with a protuberance on its back; the corolla smooth inside, the upper lip arched, sometimes notched, the lower lip more or less three-lobed; the stamens four, under the lip, all with anthers, the upper pair hairy. The curious helmet-shaped calyx, in which the seeds are generally enclosed at maturity, suggests the common names, Skullcap and Helmet-flower. Common Hedge Nettle Stachys bullata. Skullcap -Scutellaria angustifolia. MINT FAMILY. Labiatae.